... simply shells lovers ! Man passion for shells comes from the origin of mankind. They were already used at the prehistoric era to construct necklaces. Then the mediterranean people use them in classical antiquity to make the Royal Purple dye, manufactured from the mucus-secretion of the hypobranchial gland of a marine snail known as the Murex brandaris. That is only at the Renaissance that natural scientists began to collect and sort them by giving them names. Their great color and shape variety always fascinated people who collect and use them as garnishment, as money, as emblems for pilgrims and finally as collection items. Some were very rare when they were discovered at the eighteenth century and cost a fortune. But adventurers have widely explored the oceans and many have now been found common even if there are always some great rarity living in unhospitable places or at great depths. Anyway, today anyone can collect them because they can be found in all seas as well as on earth and in fresh water. Who did not have a chance to collect his first shell on a beach ? During a trip, you discovered the diversity and the beauty of living seashells, either by diving or by admiring them in local fisher's hands. You have brought back some and you decided to know more about them : you gain a foothold in collection ! Once begun, you are free to collect them by family, by geographical area, by size or even by color. You must know that every specimen has a scientific name, that it belongs to a genus and a species. There are many books and websites on the subject from general public ones to expert ones. There also are seashells collectors worldwide ready to exchange specimens. So do not stay alone in your shell, come and join us. Our main objective is to allow everyone to better know the fantastic world of shells and to support any initiatives to protect endangered species and their environmment. Our Association gathers collectors of all levels, from beginners to specialists, together and promote contacts between its members. The A.F.C. which stands for Association Française de Conchyliologie (which means French Conchologist Association ) is divided into Regional Sections with headquarters in Paris where monthly meetings occur. The Regional Sections organize Shell Shows, Exhibitions and Exchange Meetings in France all year along and participate in many events. Every year around March, the A.F.C. organizes Les Rencontres Internationales du Coquillage in Paris that gathers hundreds of worlwide collectors and scientists together. This show is one of the most important in the world. 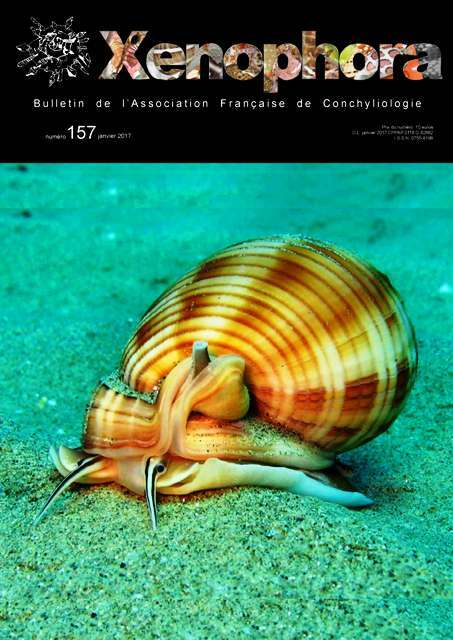 with a lot of beautiful seashells pictures to illustrate all articles. To discover the summary of the last numbers : click here . To get membership details, have a look on the subcription page. Take advantage of your first subscription to Xenophora to get the whole Xenophora numbers (sold out issue will be on CD) at a discounted price.